It’s no secret that I love Twitter, Instagram, and Central New York. Saying yes to an opportunity to do a little pro bono design for this year’s #ShowUsCNY14 event was a no brainer for me. 1. Is the work for an organization or cause that you believe in? If you’re going to design for free, it better be for something you care about. 2. Will it expose your work to a larger audience? Pro bono work can be a great introduction to other (paying) organizations and causes. It’s also a fun opportunity to collaborate with people outside of your regular client base. 3. Is there an efficient creative review process? If you’re volunteering your work, you don’t want it to suffer death by committee. The organization should benefit from your contribution and you should end up feeling good about it. If a million people are involved in approving the design, that’s probably not gonna happen. 4. Can your contribution be credited? Will the work carry a credit or a link to your website? If not, can the organization give you a shout out in some way? Asking for credit isn’t selfish since you’ll promote them as well by making people aware of your contribution. 5. Does the project give you a chance to expand your skills or work in a different style than usual? Pro bono work can be a great way to build up your portfolio in new areas or try something fun. The #ShowUsCNY14 project hit four out of five for me. That’s pretty good! I’m really looking to forward to sharing images of my favorite things about CNY with the world. Hopefully some of you will participate too! 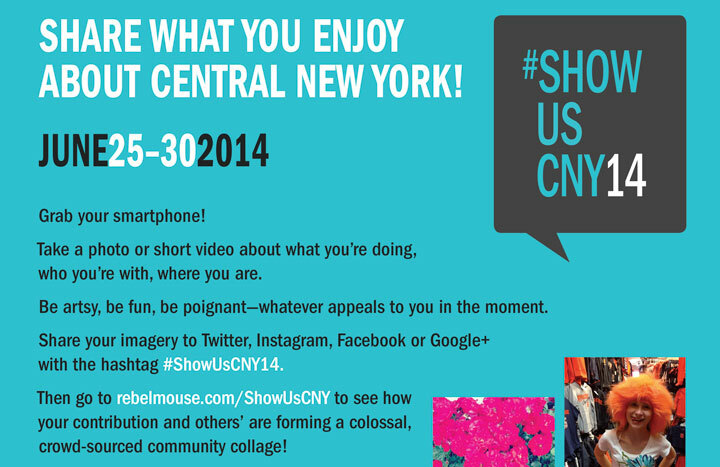 #ShowUsCNY14 is a community-wide project harnessing the creativity of individuals and the power of social media to create a crowd-sourced tapestry of life in Central New York. From June 25–30, 2014, contributors will post images with the hashtag #ShowUsCNY14 to Twitter, Instagram, Facebook, or Google+. All of the submissions will form a real-time collage on RebelMouse. A jury (including yours truly) will select 30 of the best images for an exhibition at the Everson Museum of Art from August 21–30. What makes you say yes to pro bono work?